It’s summer time and the temperature in Kerala is higher than the usual limits. Keralites finds it very hard to thrive in this temperature. Hope we will get the monsoon soon. 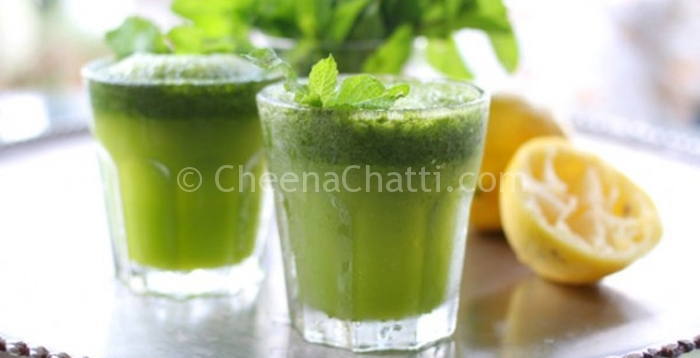 Here is a recipe of refreshing mint lemonade drink to keep you cool in this hot climate 🙂 . The mint ingredient is also good for your digestive system. It helps in easy digestion. You can take this juice after having a heavy food / an outing in the afternoon etc. This is an easy to prepare juice drink. Mix all our ingredients together and grind them all in a mixer (juicer) or food processor. Sieve it to a bowl. Taste the sweetness and add more sugar if needed. Serve it immediately poured over ice in tall glasses. Though the color looks deep green, dont get scared :). Its as refreshing as it looks. Don’t forget to serve it immediately. Because the more you keep this, the more the color fades, sometimes turning a more muddy brown that does not look so appetizing. In some parts of Kerala a new type of lemonade drink – Kulukki Sarbath is getting very popular. We also have the recipe for Kulukki sarbath. Don’t forget to try both the lemonades and share your preparation details with me. Do you need more lemon recipes? How to make spicy ginger lemonade at home? This entry was added on April 22nd, 2013 by Renoos in Desserts and tagged with mint lime juice, green lemon juice, lemon, dessert, iftaar recipes, mint lemon juice, lime juice, lemon juice, lemon with mint. Last revised on April 4th, 2018. Recipe & Recipe photo contributed by Saumya S.